A total of 39 records matched your search. 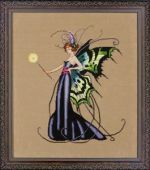 August Peridot Fairy from Mirabilia Designs is stitched on 16/32ct Milk Chocolate with a stitch count of 198w x 230h using DMC floss with 7 different Mill Hill Beads and 3 Mill Hill Treasures. 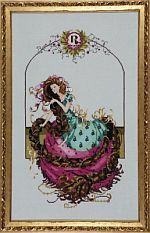 Bluebeard's Princess by Nora Corbett from Mirabilia is stitched on 32 count Laurel or a 16 count comparable fabric with a stitch count of 160w x 228h using DMC or Anchor floss, 4 Waterlilies, with 4 Kreinik Metallic Braids, Mill Beads and Treasures. Charlotte from Mirabilia is stitched on 16ct or 32ct Beach Walk or a fabric of your choice with a stitch count of 191w x 254h. This pattern uses DMC floss, 2 Mill Hill Beads and 6 different Mill Hill Treasures. 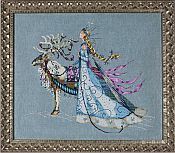 Deepest Love by Nora Corbett from Mirabilia is stitched on 16 count or 32 count Amsterdam Blue with a stitch count of 172w x 225h using DMC or Anchor floss with 1 Kreinik Metallic Braid, Mill Beads and Treasures. Elizabeth from Mirabilia is stitched on 16/32 count Natural with a stitch count of 212w x 277h using DMC/Anchor floss and 2 Mill Hill Beads. 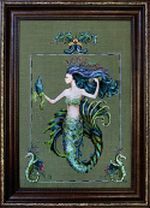 Emerald Mermaid by Nora Corbett from Mirabilia is stitched on 32 count Stoney Point or a comparable 16 count fabric with a stitch count of 233w x 134husing DMC or Anchor floss with 1 Kreinik Metallic Braid and Mill Beads. 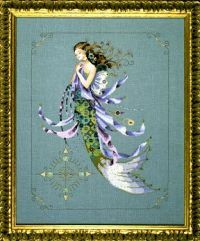 Enchanted Mermaid from Mirabilia is stitched on 16ct or 32ct Twilight Blue or a fabric of your choice with a stitch count of 168w x 258h. 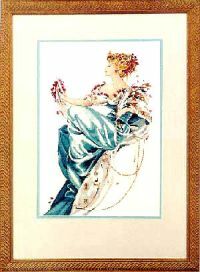 The patterns uses DMC floss and 4 Kreinik Metallic Braids and has Mill Hill Beads and Treasures. 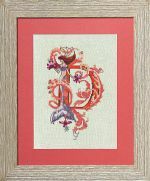 Florentina by Nora Corbett of Mirabilia Designs is stitched on 16/32 count White Chocolate or a fabric of your choice with a stitch count of 192w x 295h. DMC floss is used with 7 Caron Waterlilies hand-dyed silks, 2 #4 Kreinik metallic braids, 2 colors of Mill Hill beads and a Mill Hill treasure. 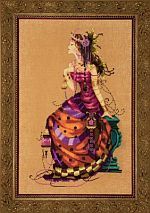 Gypsy Queen by Nora Corbett is stitched on 16/32 count Milk Chocolate or a fabric of your choice with a stitch count of 171w x 286h. The pattern uses DMC/Anchor, 1 Rainbow Gallery Wisper fiber, 3 Caron Collection Waterlilies silk threads, 3 Kreinik metallic #4 Braid, 5 colors of Mill Hill Beads and 2 Mill Hill Treasures. 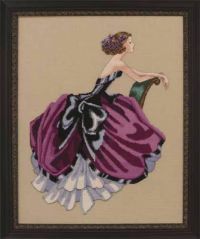 Lady Alexandra by Mirabilia is stitched on 16/32count Twilight Blue fabric with a stitch count of 126w x 262h using DMC floss and Mill Hill Beads. 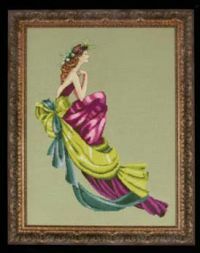 Lady Hera by Nora Corbett from Mirabilia is stitched on 16 count or 32 count Tumbleweed with a stitch count of 188w x 301h using DMC or Anchor floss,1 Gloriana Silk Floss, with 3 Kreinik Metallic Braids, Mill Beads and Treasures. 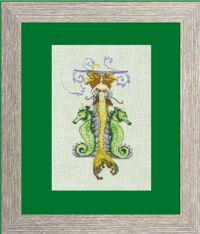 Letters from Mermaids 'D' from Nora Corbett is stitched on 16/32 count Waterlily with a stitch count of 79w x 125h using Crescent Colours and Mill Hill Beads. 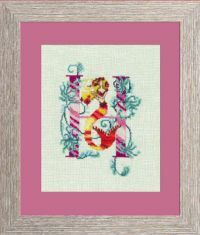 Letters from Mermaids 'E' from Nora Corbett is stitched on 16/32 count Waterlily using Crescent Colours and Mill Hill Beads. 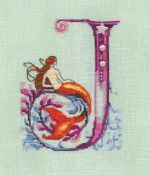 Letters from Mermaids 'F' from Nora Corbett is stitched on 16/32 count Waterlily using Crescent Colours and Mill Hill Beads. 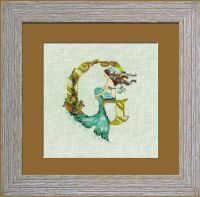 Letters from Mermaids-G from Nora Corbett is stitched on 16/32 count Waterlily with a stitch count of 86w x 91h using Crescent Colours and Mill Hill Beads. 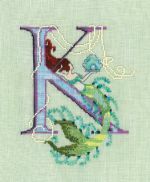 Letters from Mermaids-K from Nora Corbett is stitched on 16/32 count Waterlily with a stitch count of 91w x 108h using Crescent Colours, 2 Kreinik Metallic thread and 2 Mill Hill Beads. 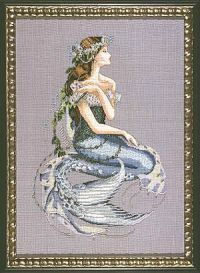 Mediterranean Mermaid by Nora Corbett from Mirabilia is stitched on 16 count or 32 count Star Saphhire with a stitch count of 233w x 118h using DMC or Anchor floss with 6 Kreinik Metallic Braids, Mill Beads and Treasures. 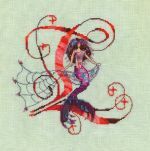 Merchant Mermaid by Nora Corbett from Mirabilia Designs is stitched on 32ct Laurel Linen or a fabric of your choice with a stitch count of 199w x 270h using DMC, 6 Caron Collection Waterlilies, 2 Kreinik #4 Braids and 1 Kreinik Blending Filament, 9 Mill Hill Beads and has 4 different Mill Hill Treasures. 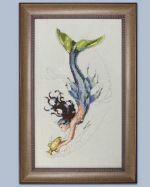 Mermaids of the Deep Blue from Mirabilia is stitched on 16 count or 32 count Amsterdam Blue with a stitch count of 156w x 312h using DMC or Anchor floss, 4 Kreinik Metallic Braids and Mill Hill beads and Treasures. 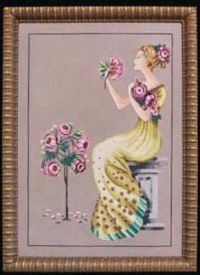 The Peony Garden from Mirabilia is stitched on 16ct or 32ct Light Pink Sand with a stitch count of 190w x 290h. This pattern uses DMC floss, 5 Caron Collection Waterlilies, Kreinik Blending Filament and 2 Mill Hill Beads. 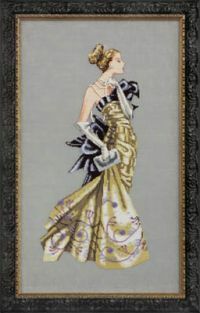 Queen Mariposa another elegant lady from Mirabilia is stitched on 32 count Desert Sand with a stitch count of 180w x 260h using 1 Caron Collection Waterlily silk fiber, 1 Petite Silk Lame, 12 different Mill Hill beads and one Mill Hill Treasure. 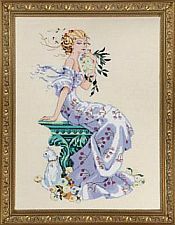 Roses of Provence designed by Nora Corbett from Mirabilia is stitched on 16/32 count White Chocolate with a stitch count of 220w x 260h using DMC floss, 1 Kreinik #4 Braid, 4 Mill Hill Beads and 3 Mill Hill Treasures. Sabrina from Mirabilia is stitched on 16 count or 32 count Natural Light with a stitch count of 198w x 260h using DMC or Anchor floss, 1 Kreinik Metallic Braid, 2 Caron Waterlilies, and Mill Hill beads and Treasures. 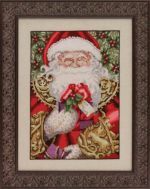 Santa from Miribilia is stitched on 32ct French Lace or a 16ct fabric of your choice. 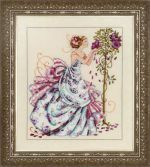 The design size is 8" x 11" and uses DMC floss and 5 Mill Hill Beads. 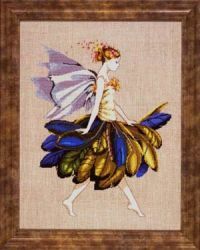 Shakespeare's Fairies from Mirabilia is stitched on 32 count Laurel with a 16 count comparable fabric with a stitch count of 307w x 136h using DMC or Anchor floss, 6 Kreinik Metallic Braids, and Mill Hill beads and Treasures. 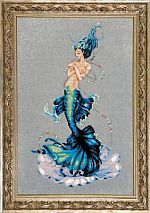 Shimmering Mermaid from Mirabilia is stitched on 16 count or 32 count Amsterdam Blue fabric with a stitch count of 202w x 252h using DMC floss, 5 Kreinik metallic braids and 5 Mill Hill Beads. 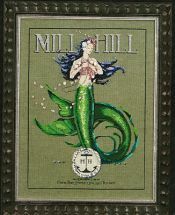 Siren and the Shipwreck by Nora Corbett, Mirabilia Designs is stitched on 16/32 count Sea Lily with a stitch count of 141w x 262h using 2 Caron Collection Waterlilies, 2 Kreinik #4 Braids, 9 Mill Hill Beads,5 different Mill Hill Treasures, DMC floss. An embellishment pack is available containing the beads and treasures for $42.99. 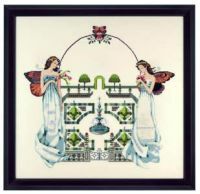 Spring Topiary Garden by Mirabilia Designs is stitched on 16ct or 32ct White with a stitch count of 280w x 274h using 8 Caron Collection Waterlilies, 3 Kreinik Metallic Braids DMC/Anchor and 8 Mill Hill Beads. 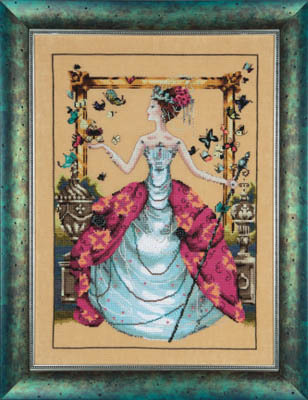 The Summer Queen from Mirabilia is stitched on 16 count or 32 count White with a stitch count of 187w x 284. DMC or Anchor floss with 4 colors of Mill Hill Beads are used. 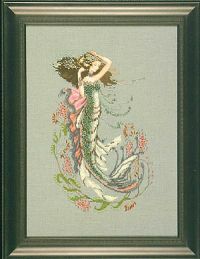 The Feathered Fairy from Mirabilia is stitched on 32 count Natural Linen, a 16 count comparable fabric may be used with a stitch count of 193w x 243. 2 Kreinik Metallic threads are used, 1 Mill Bead and DMC or Anchor floss is used throughout. 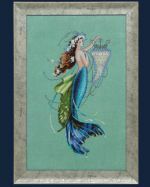 The South Seas Mermaid by Nora Corbett from Mirabilia is stitched on 16 count or 32 count Amsterdam Blue with a stitch count of 138w x 213h using DMC or Anchor floss with 2 Kreinik Metallic Braids, Mill Beads and Treasures. 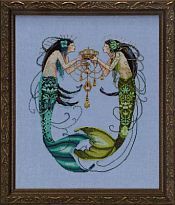 The Twin Mermaids by Mirabilia is stitched on 16/32 count Sea Spray with a stitch count of 238w x 278h. DMC floss is used with 7 colors of Caron Collection Waterlilies, 3 colors of Kreinik #4 braid and 12 colors of Mill Hill Beads.